The last decade has seen rapid advances in connectivity, mo­bility, analytics, scalability and data, creating what some call the fourth industrial revolution, or Industry 4.0. With the help of the Industrial Internet of Things (IIoT), manufacturers have digitized operations, transforming efficiency, supply-chain performance and in­novation. This revolution has even created entirely new business models. 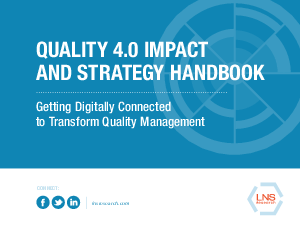 This e-book gives manufacturers the tools to lead the Qual­ity 4.0 transformation – a transformation that raises traditional manufacturing to the next level. It teaches readers to use advanced technology, analytics and IIoT to strengthen the manufacturing process and bring it forward into a powerful digital age.